Snake bite victims in the UK often wait too long for treatment, putting them at a higher risk of developing a long-term disability, according to researchers. Around 50 to 100 people are bitten by venomous adder snakes in the UK each year, mostly in summer. In July, 14 people received hospital treatment for adder bites nationwide, but some arrived too late for it to be effective. Professor Michael Eddleston, of the University of Edinburgh, said: "We're seeing an increase in people who have been bitten coming to hospital after 24 hours or so, when their swelling is already quite severe. This puts them at risk of painful mobility problems. "Treatment is much more effective if given early and we would urge victims to get to hospital as quickly as possible. Not all will require antivenom but those who do will get it quickly, limiting the extent of the swelling and the long-term complications." The most common consequences of poisonous adder bites are swelling and bruising, which can extend from the hand to the chest wall or from the foot to the groin. This can be made worse by having to walk back to a road to reach transport. Antivenom can substantially reduce the severity of the injury if given early. However, delaying treatment can lead to intense swelling and pain of the bitten limb and mobility problems that require long-term physiotherapy. Researchers at the university have urged any snake bite victims to seek urgent medical attention after the getting injured. It is also strongly advised that medical travel insurance is considered before undertaking any kind of trip, even when not heading abroad. 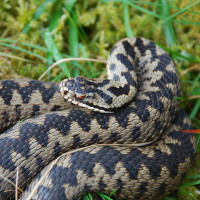 Adders are the only species of poisonous snake found in the UK. Their bites are more common in the summer months, when they are more active. Sometimes venom is not injected so may not require treatment, although doctors say they should still be monitored for potential problems. In some cases, bites can cause patients to faint. They can also cause the tongue to swell up, which can lead to breathing problems.